If you’re a fan of sweet rice you may be interested in trying this lesser known variety. Sweet Rice Flakes is a particular type of sweet rice that is harvested when it’s young, pounded or pressed into flakes and then lightly toasted. It is similar to rolled oats in color and texture but lighter with a more delicate taste and crunch. Often times this rice is enhanced with Pandan flavor or green food coloring to make it more aromatic and colorful. Depending on where you live, you may only be able to find the green-colored variety. When shopping at your Asian grocery store, look for it under other names such as Pounded or Pressed Young Rice, Young Sweet Rice, or Young Green Rice. In health food stores, it is often called Rolled Rice. This dish is so easy to make because it involves no cooking! (Hard to believe, right?) It does take some time to rehydrate the sweet rice flakes. The trick is to do it slowly and allow the flakes to gradually absorb the water and coconut milk. Add it too quickly and you’ll have soup rather than fluffy sweet rice. Overall, the recipe is pretty simple requiring just a few basic pantry items. For the coconut topping, I recommend using fresh young coconut. Shred the coconut yourself or use the conveniently packaged frozen variety. When using frozen coconut, thaw at room temperature and drain any water before adding to the sweet rice. Enjoy! Place sweet rice flakes into a large bowl. Sift through the flakes and remove any brown irregular flakes and discard. Transfer flakes to a colander with a bowl. Quickly rinse the rice flakes with cold water. Do not allow the flakes to soak in the water for long. Scoop out any bits of husk that float to the top. Repeat the rinsing process 2 more times. Toss the rice flakes in the colander for about 1-2 minutes shaking off as much of the excess water as possible. Pour the rice into a large pan or plate and spread it out into a thin, even layer. Allow to air dry for 1 hour. In a measuring cup combine the sugar, vanilla sugar, and coconut milk. Stir until sugar is dissolved. 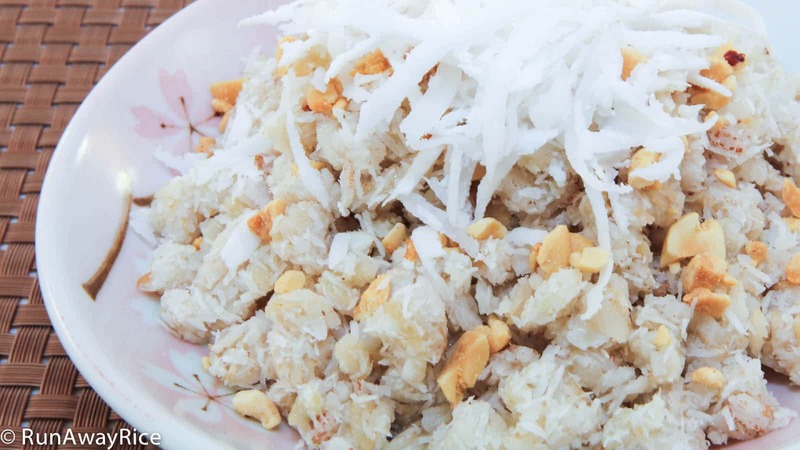 Drizzle 3 Tbsp of the coconut milk over the sweet rice flakes and combine together. Let it air dry for another 30 minutes. Add the dried grated coconut and toss together. 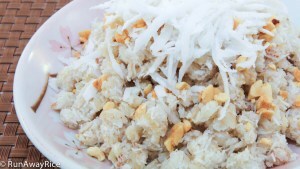 To serve, scoop out a generous amount onto a plate and then top with the crushed roasted peanuts and shredded coconut. Store any uneaten amounts in the refrigerator for up to 1 week. Reheat in the microwave or allow to come to room temperature before serving. I’ve added to the list for upcoming videos so please stay tuned. They sell both the green and white flakes in the store and this banh uses the green flakes. This cake really is pretty and smells so good! Do you hear about “Banh Com” which is the tradiction cake in wedding in Viet nam. I am curious to ask if you have any idea you can share with us :). I wait for your next recipe :). I always have happy cooking when I cook your recipes. What a coincidence! I was just looking at this recipe this week and thinking about sharing this. Do you like Banh Com? Have you tried making it?